In the world outside Point Roberts the political, religious and cultural twist to the left or the right is very obvious. Today Democrats and Republicans are a prime example of two opposing factions that have no end of verbal warfare and media smear campaigns at any given moment. Each of us is seen as a moving target for one cause or another. In the end each issue wants us to vote for their candidates or programs while donating our time and hard earned dollars to promote their agendas. Mass media created verbal insults and now even psychic assaults seem totally unavoidable. As I drive my monthly photo circuit through Point Roberts I am constantly reminded of the beauty and informality of this community with a perpetual time warp attachment. One has to look hard to see the occasional street signs and the individual house numbers are hit and miss in most cases. However, when we get near the borderline the outer world is pushing us to make a decision to maneuver left or right and conform to the traditional traffic flow of the "real world." 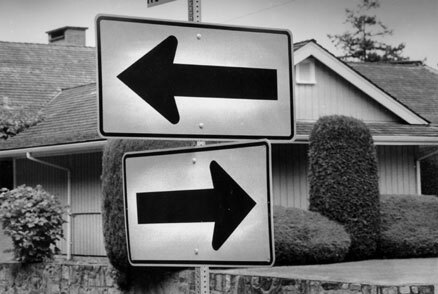 In retrospect these signs do not give any hint of an understanding that life has it's ups and downs to deal with also.